Last week Mali’s political scene appeared to be moving in the right direction. Prime Minister Diarra’s transitional government was finally named, and the CNRDRE junta in Kati was keeping relatively quiet, having gone several days without arresting anyone. Even the power outages that were daily throughout the first half of April had become rare. Most regular Bamakois I knew — i.e., those not involved in politics — were satisfied that the state could at last get back to dealing with urgent matters, most notably Mali’s de facto partition after separatist rebels last month took over the northern half of the country. Yes, there was still uncertainty over how the transition would play out after the 40-day interim period mandated by Mali’s 1992 constitution. There was concern over the junta’s lingering presence in state media outlets (which continue to give more attention to CNRDRE head Captain Amadou Sanogo than to interim president Dioncounda Traoré). 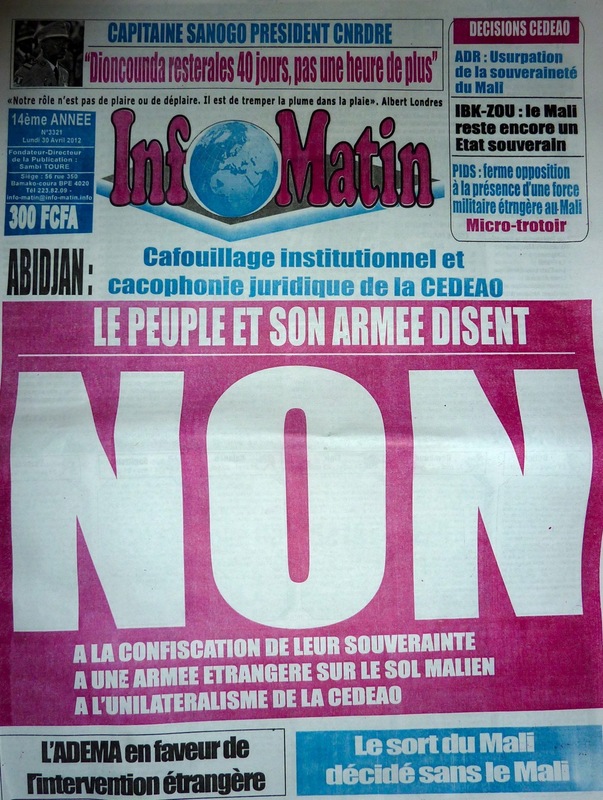 And there were objections that the new government had been formed without sufficient consultation of Mali’s so-called “forces vives” — a term which, in Bamako these days, is used more and more to refer to representatives of various political parties, as well as to civil society leaders and virtually anyone else who thinks they have something to say about the state of the nation. Overall, however, efforts by Mali’s new civilian authorities and by the international community to get the government up and running again, without undue interference by the military, seemed to be working. Then, late Thursday, we learned that a summit of West African heads of state in Abidjan, organized by the Economic Community of West African States (ECOWAS), had decided to fix the duration of Mali’s transitional president and government at 12 months, and to dispatch at least 3000 soldiers to Mali to “secure the transitional government” and “supervise the transition.” And they threatened targeted sanctions against junta leaders who didn’t abide by ECOWAS decisions. Responses to this declaration from Bamakois have been highly critical. A good many people here see the CNRDRE as having a legitimate role in Mali’s political process, as I wrote a month ago, and they don’t like to see Captain Sanogo and his men threatened. Nobody is keen on having their country’s transition managed by outsiders, especially by foreigners whose own democratic credentials are often dubious at best. On top of that, Malians wonder how ECOWAS, for all its emphasis on respect for constitutional process, can unilaterally extend the length of the transition beyond the 40 days provided for by Mali’s constitution. 40 days may be too short to achieve very much, but any modification of that period ought to come from within Mali’s political system rather than being imposed from outside. At the Kati army garrison where the CNRDRE is based, tempers flared. Rowdy troops gathered to jeer at the foreign minister of Burkina Faso, Djibril Bassolé, who had come to represent ECOWAS in talks with junta leaders, and reportedly cocked their weapons to demonstrate their opposition to any compromise. Captain Sanogo, despite the cagey game he’s played to stay in the political picture, has always publicly stated his support for regional mediation of Mali’s crisis, and now it’s unclear whether he can make his men respect any deal brokered with ECOWAS. He has repeatedly rejected any foreign troop deployment in Mali. Many observers, myself included, have a great deal of respect for the role the Burkinabè, particularly Foreign Minister Bassolé, have played throughout this crisis. Bassolé has demonstrated quiet, effective diplomacy and a knack for heading off conflicts. But the ECOWAS heads of state, with their deadlines and threats, have put him in a difficult position. The risk now is that more Malians (especially those in and around Bamako) will start to perceive the current crisis as pitting Mali’s needs against sinister foreign agendas, as the country’s anti-globalization left has been depicting things all along. Up till now those radical anti-ECOWAS voices have been a tiny fringe, but in light of the heavy-handed tactics recently adopted by ECOWAS, they are growing louder and more numerous by the day, putting further attempts at outside mediation in jeopardy. An anti-ECOWAS rally has already been announced for Thursday. It’s been said that “diplomacy consists of telling the other guy to go to Hell in such a way that he looks forward to the trip.” Rattling sabers and issuing ultimata may sound great, but it’s ultimately counter-productive in situations like the one Mali faces now. If ECOWAS leaders truly seek a diplomatic solution to Mali’s current political mess, they need to tone down the rhetoric and give Captain Sanogo and his men a face-saving way out. Lacking that, the progress of the last few weeks will prove to be very short-lived, and Mali’s most pressing goal — reunifying the country — will grow ever more remote. This entry was posted in Uncategorized and tagged bamako, cnrdre, ecowas, mali, modibo diarra, politics. Bookmark the permalink. Excellent piece as always! We don’t need any foreign soldiers in Mali and I fully support Sanogo even though I am not in favor of any coup. Would you mind elaborating in Dionkounda’s role in ECOWAS decision? Because I can’t believe as the president he can just sit there, sign the cheque and take note? If that’s what he has done, then I don’t mind another coup in a couple of weeks! I notice a similar response from a lot of Bamakois–“I’m against the coup, but…” It’s that “but” that has helped Sanogo stay on the scene as long as he has. 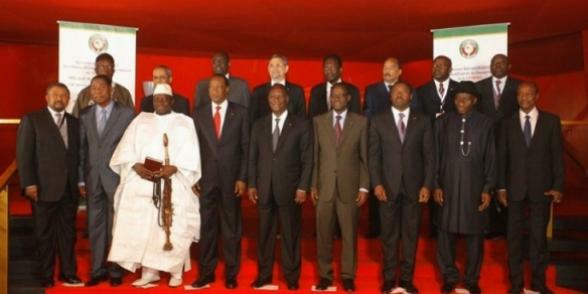 As for Dioncounda, I notice that he was present at the Abidjan summit, but that’s all I know. As usual, the ORTM news isn’t televising his activities or speeches, if he’s even giving speeches that is. In general he seems to lack relevance and it’s unclear just what his role in this transition (whether it lasts 40 days or 12 months) is meant to be. Dioncounda doesn’t seem to care, to be honest. But he is making a huge mistake by not standing up against foreign troops because Malians will side with Sanogo. With 3000 soldiers in Bamako, Sanogo will have to slow down. If these soldiers arrive in Mali, the next request of ECOWAS and “international community” will be to negotiate with the rebels, therefore legitimating Azawad since more and more diplomates are sort of implying that the rebels will prevails in theirs quest. At least, that’s how I see it. Tomorrow It’s a meeting between the ex junta and Blaise Compaoré. Compaoré seems to be a big supporter of the democracy *irony*. “Ex-junta”? What exactly is “ex” about the CNRDRE? As long Capt. Sanogo doesn’t speak of his junta in the past tense, I don’t think we should either. I say Bruce Whitehouse for President. Your understanding and reporting of the crisis far exceeds what we read in the mainstream press. Hopefully one day you write a text about these events that can be used as material for a Harvard poli-sci class. My feeling is that D. Traore was a big influence on the decision to send troops to Mali. I think he went and told the truth to ECOWAS about the junta’s real goals and tactics even personally with him. He is being intimidated and not allowed to be the interim president he should be. The biggest problem Mali has in the junta. Until they stay out of politics the north will continue to get worse and the country will fall apart. This is sure. Malians needs to wake up. Your interpretation of events is highly plausible to me, but the ECOWAS response is still the wrong approach. The best way to deal with the junta is to make them irrelevant to Mali’s situation; all the ECOWAS leaders have done is put Sanogo and his men at center stage. Don’t get me wrong. I also don’t like the approach ECOWAS took. I was simply making the point that Sanogo is the problem and is the reason Mali in falling right now. Making the junta irrelevant sounds decent but doing that might anger them more and lead to a possible second coup. I think they like the power now and don’t want to be made irrelevant in any way. We need better diplomats/negotiators to talk directly with Sanogo and the leaders of the CNRDRE to make them really understand that their stepping aside will assist the country and the north problem. It will also be better for Sanogo political CV. If he did this he may be able to run for president in 10 or 15 years when he is a bit older and wiser – having one the respect of the Malian public.